Although now run under the rules of the Scottish Amateur Athletic Association, the sports meeting in conjunction with the Glasgow Police Athletic Club maintains most of its old characteristics. Juvenile dancing and piping are prominent features, and on Saturday there were included in a long afternoon’s programme such Highland gathering events as tossing the caber, Cumberland wrestling, a high jump characterised as a running high leap and a tug of war. In the last named contest the Glasgow Police again proved their prowess by disposing of the Corporation Tramways representatives. The attendance was estimated at little short of 18,000, showing that the meeting had lost none of its attractiveness for those who like a feast of good things. The flat races, though few of the champions were present, provided some good finishes, there being two dead-heats in the open 100 yards and a very close finish in the final, while the closing stage of the furlong was almost equally thrilling. The meeting was well managed and expeditiously carried through, the last event on the programme being finished in advance of the time table. The Glasgow Herald, 4 July 1921. That was the report in its entirety for the first meeting of the decade. There was to me a wee bit of condescension in the first two sentences but the public clearly didn’t feel put off if we judge by the attendance which was bigger than it would be in most years thereafter. The absence of big names such as could be drawn to compete at the Rangers FC and Celtic FC Sports did not affect the quality of competition on a meeting which at this point came the week after the SAAA championships and clashed with the AAA’s in England. Later in the decade it would settle into a slot the week before the SAAA Championships and would prosper because of that. 100 yards: 1. H Blair (Olympic Harriers 7 yards); 2. J Williamson (Dumbarton AAC 8). 10.2 seconds. Won by Inches. 220 yards: 1. H McDowell (Paisley YMCA 15 yards); 2. H Harvey (Shettleston Harriers 13 yards). 23.8 seconds. Close finish. 440 yards: 1. HJ Christie (West of Scotland 15 yards); 2. J McAlpine (Bellahouston H 12 yards) 51.8 seconds. Won by a foot. Mile: 1. JB Craig (Bellahouston Harriers 100 yards); 2. AB Lawrie (Garscube Harriers 105 yards). 4:30.8. Won by two yards. There were fourteen events in all plus of course a five a side football competition in which Rangers with 1 goal and 2 corners beat Clyde who only had 1 goal. The close finishes above indicate a good afternoon’s sport with decent handicapping and there were several competitors who would be well known to future generations – I select only George Dalls who was third in the quarter mile (‘a good third’) and fourth in the half mile. The 1922 sports were held on 1st July – a date which again coincided with the AAA’s championships in England and press coverage suffered because of that. The weather was showery (for Glasgow in July, maybe to be expected) and a crowd of approximately 10,000 turned out for the event. The reporter seemed more accepting of the meeting than in 1923 with fewer asides incorporated in the report. The principal open results are noted. 100 yards: 1. H Savage (Glasgow YMCA 10 yards); 2. G Drummond (West of Scotland 4.5 yards). 10.2 second. Won by half a yard. 220 yards: 1. JK Braid (Shettleston Harriers 12 yards); 2. J Brown (Maryhill Harriers 13 yards). 23 seconds. 440 yards: 1. J Cromar (West of Scotland 18 yards: 2. LS Barton West of Scotland 8 yards). 51.6 seconds. Mile: 1. T McGill (Maryhill Harriers 135 yards); 2. JJ Quinn (Shettleston Harriers 135 yards). 4:25 seconds. A close finish. Two Miles Walk: 1. E McLeod (Shettleston Harriers 100 yards); 2. W Armitage (Shettleston Harriers 155 yards); 3. C McLellan (Glasgow Police & Shettleston). Won by 10 yards, a similar distance between second and third. The programme also included some races for ‘Youths’, field events, wrestling, tug of war and events confined to policemen. 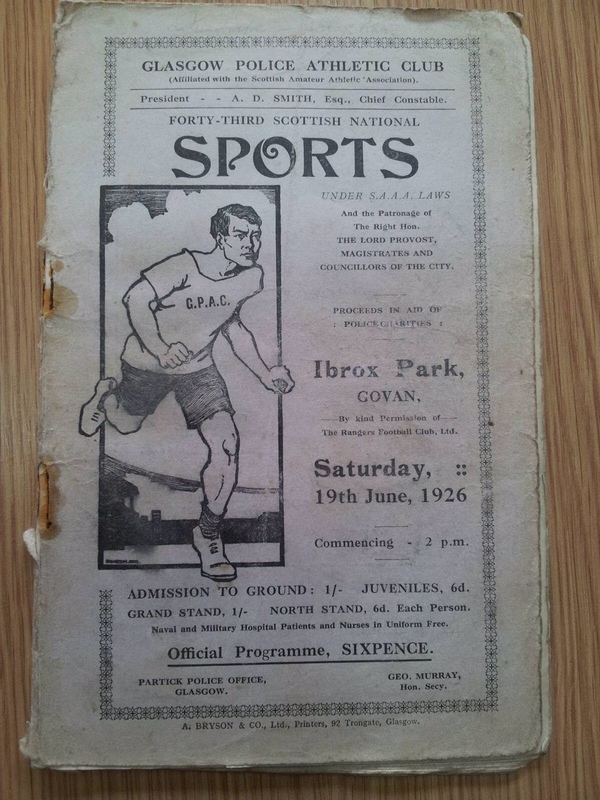 The Sports Meeting of the Glasgow Police Athletic Club has now achieved venerable antiquity, the gathering at Ibrox on Saturday last being the 40th of the series. For many years the meeting was a professional function, but latterly the organisers were persuaded to come under the laws of the SAAA and the sports have ever since been confined to amateur athletes. The club have had little reason to regret the change, as is evidenced by the attendance of fully 10,000 at Ibrox. As has always been the case, the sports combined the usual features of an athletic meeting with those generally associated with the Highland Games, the events including tossing the caber, piping and dancing, tug of war, and a variety of field and heavy events. The outstanding feature of the meeting was the success of TR Nicholson, the Scottish champion, who secured first place in the three events in which he competed – putting the ball, throwing the weight and tossing the caber. Duncan McPhee, the mile and half-mile champion, ran somewhat disappointingly in the former event, making little impression on the long start men, and he did not turn out in the mile having left for Edinburgh before that event was called. 100 yards: 1. J Crawford (QPFC 9.5 yards); 2. AMorrison (GUAC); 10 seconds. Won by inches. 220 yards: 1. P Gardiner (Bellahouston 9 yards); 2. P McIntyre (Maryhill H 9.5 yards). 23.2 seconds. Won by a foot. 440 yards: 1. JG McColl (GUAC 10 yards); 2. W Neilson (Plebeian Harriers 32 yards) 53 seconds. Won by 10 yards. 880 yards: 1. JW Stepley? (Shettleston H 46 yards); RR McIntyre (West of Scotland 13) 2:01.2. Won by inches. Mile: 1. WH Calderwood (Maryhill H 40 yards); 2. J Mitchell (Mauchline H 65 yards). 4:32.8 Won by a yard. The report on the meeting of 22nd June, 1925 read: The Glasgow Police Club are to be congratulated on the success of their forty second annual meeting at Ibrox Park, as it was so admirably organised that the somewhat unwieldy programme was finished ten minutes inside the estimated time schedule. The brilliant weather conditions also played their part with the result that few of the 20,000 spectators saw reason to depart before the programme was completed. In the circumstances it was not surprising that times ruled very fast. In the open sprint even times was clocked no fewer than six times in the Heats and semi-finals, and in the Final of the same event the winner, JNK Clarkson, of Edinburgh University was returned as having run 9 4-5th seconds. As he was running from the 10 yards mark, the old Watson’s College boy seems to have been generously dealt with. The feature of the sprint however was the strong running of J Crawford and R McLean. The first named, although unplaced in the final, won his heat and dead-heated in the semi-final in even time, and as he was running from the three-quarter yard mark, these efforts indicate that EH Liddell will have to travel to retain his title at Hampden. McLean who finished second, a yard behind Clarkson, also returned evens in his semi-final. Clarkson almost brought off a double, being beaten only by inches in the final of the furlong, and another Edinburgh competitor, JS O’Hara, a Navy man who runs in the colours of Edinburgh Northern Harriers, captured the open mile in 4:23. The meeting in 1926 was a success – if you call an attendance of 16,000 and a new Scottish record a success, that is. Held at Ibrox in dry but dull weather, A Smith set the new record for the shot putt with 32′ 8″which added 1′ 11″ to his previous best set at the SAAA Championships the previous year. There were six confined events with the half-mile being won by Donald MacLean from Greenock in 2:04 from scratch, the report read “won easily.” It was an enjoyable meeting but none of the recognised ‘;stars’ were in action in any of the 13 open events. 100 yards: 1. P McIntyre (Maryhill Harriers 6 yards); 2. A Mackintosh (Glasgow Harriers 9.5 yards). 10.4 seconds. Won by inches. 220 yards: 1. WG Lawn (Bellahouston H 9 yds); 2. J McColl (Bellahouston Harriers 9 yds) 23.8 seconds. Won by inches. 440 Yards: 1. TJ McAllister (Beith H 18 yds); 2. R Davie (Springburn H 26 yds). 52.2 Won by a yard and a half. 880 yards: 1. JR Orr (Glasgow YMCA 60 yards); 2. KA Smith (Glasgow YMCA 37) 2:01.8. Won by three yards. Mile (first class): 1. D MacLean (Maryhill H 25 yards); H Boyd (Bellahouston H 65 yds). 4:27.8. Won by 10 yds. Mile (second class) 1. J Dobbie (Garscube H 130 yards); 2. SC McKenna (Plebeian H 130 yds) 4:27.6. Won by four yards. Interesting to note that the handicapping produced almost identical winning times for the two Mile races and to speculate on how they would have finished had the fields been amalgamated. The event was held on June 16th in 1928 and the fairly common complaint about the length of the programme surfaced again. “As the years go on the programme submitted at the Glasgow Police gala grows bigger and bigger, and after Saturday’s experience it may be well in the officials responsible curtailed it somewhat, or held eliminating trials which would obviate the proceedings lasting inordinately long. Five hours of athletics, even of the variety submitted on Saturday, is too much for the ordinary individual, and while recognising that the police draw their support from persons who are more interested in themselves than in the sport, and have to cater accordingly, a little more consideration would enable their meeting to follow the proceedings in a more enlightened way. Nevertheless the sport, especially in the flat events, was always interesting and good. The strong contingent from the Dublin Civic Guards who were competing met with success in good measure, and one of them, M Glynn, had the rare experience of winning three handicaps in one afternoon. Glynn won all three events – 100 yards and 220 yards confined and 100 yards open – with ease, and if, as we understand, his handicap at home is one yard more than he received on Saturday the standard in Ireland must be much higher than it is here. A compatriot, MM Abader, occupied second place in both confined sprints, and also took second place in the open furlong, so that he too had a good afternoon. In contrast W Shannahan, the Irish high jumper, would have had to clear 6′ 4″ to win the high jump, and his 5′ 10.5″ did not even find a place in the prize list. 220 yards: 2. R Hamilton (Lenzie RFC 12 yards); 2. MM Abader (Dunblin CG 13 yards); 22.8 seconds. Won by inches. 440 yards: 1. EJ Wheeler (West of Scotland 32 yards); 2. J Hood (Shettleston H 12) 50.6. Won by two yards. 880 yards: 1. J Hood (Shettleston Harriers 20 yards; 2. J Hawthorn (Shettleston H 52 yards). 2:01. Won by five yards. 1 Mile (First Class). 1. WJ Gunn (Plebeian Harriers 65 yards); 2. SK Tombe (Plebeian Harriers 70 yards) 4:27.6. Won by two yards. 1 Mile (Second Class) 1. PJ Connolly (Plebeian Harriers 125 yards); 2. WH Bremner (West of Scotland 130 yards) 4:29.1. Won by ten yards. “The fact that the Scottish Championships are to be decided this week lent more than ordinary interest to the meeting of the Glasgow Police Club held at Ibrox Park on Saturday afternoon, for with so many contenders for honours in opposition, it was felt that fresh light would be thrown upon their chances at Hampden Park five days hence. Particularly so was this the case in the 100 yards where RA Robb, the present holder, James Crawford and Ian Borland were all entered. Robb and Crawford ran from scratch, Borland from a yard and a half and when all three won their heats it looked as if we were to have a full dress rehearsal of next Saturday’s more important event. Fate, however, in the person of JS Smith, the old Govan High School champion and at present a student at Gilmorehill, interposed in the semi-finals where he defeated Crawford in even time by two yards. In the final Smith again ran strongly to win from Borland by a bare yard with Robb fourth. It is rare that Glasgow University has provided three of the four finalists in an open sprint of any importance, nut it is consistent with public performances this season, as results have shown the present standard at Westerlands to be an excellent one. The riddle of who will be this season’s sprint champion will not be solved until Saturday. Crawford, who is apparently running as well as ever, is favourite in some quarters for the double event, and he has undoubtedly a great chance. On the other hand, Robb and Borland must be able to gauge their chances fairly accurately with their home running against W Wright and JS Smith both of whom have won open handicaps this season. Two new Scottish records were created in the 56lb weight and the relay. In the weight, Alexander Smith of the Glasgow Police improved upon his own record of 1927 with a great throw of 35′ 1.5″, an advance of no less than 2′ 0.5″ , an excellent performance and one which it is questionable if any of our professional heavyweights could improve upon or even equal. The Edinburgh students returned 3:37 in the relay which is 3 sec faster than their time of 1922, when Eric Liddell was a member of their team. This accomplishment was mainly due to the fine running of HC Maingay in the half mile and D Paton in the first of the furlongs but both RL Howland and FP Reid contributed their quota to the victory over Beith Harriers and the other Western clubs. Maingay clearly showed that he has lost none of his running since last year, and in his public appearances this season he has been running well within himself. Opposed by J Calder of Beith who has shown himself to be the best of Western half-milers, the Yorkshireman let himself go and was timed as doing 1:59. He was some eight yards in front of Calder which shows that the Beith man ran a good race. The advantage gained at the handover was enhanced by Paton and the race was practically over when Howland took the baton. There is sure to be some discussion on the latter’s inclusion in the Edinburgh team as he has taken part in several competitions this season for the Achilles club. 100 yards: 1. JS Smith (GUAC 5 yards); 2. J Borland (GUAC 1.5 yards). 10.2. Won by a yard. 880 yards: 1. TJ Goldie (Shettleston Harriers 46 yards); EM Young (GUAC 48 yards). 2:02.5 won by 5 yards. Mile First Class: 1. TJ Goldie (Shettleston 95 yards); 2. WJ Gunn (Plebeian Harriers 40 yards). 4:25.4. Won by 5 yards. Mile Second Class: 1. D McSwein (Greenock Wellpark 115 yards); 2. J Gardner (Bellahouston H 130 yards). 4:26.2. Won by three yards. Third in the second class mile was David Brooke of Garscube Harriers – along with Duncan McSwein who won the race he would also become one of the country’s top officials for a long time after th1 9139 – 45 war. Those of us who only see men like George Dallas, Duncan McSwein, David Brooke and more recently men like Rab Foreman as officials tend to assume that they were never competitors themselves. Many of them were – and they were better, more insightful, more understanding and more sympathetic officials because of it.